Please review our Copyright statement before copying any web page or image. Our secure online Membership/Renewal Application and book order form is now powered by PayPal. The secure checkout procedure will lead you through the process with or without a PayPal account by using any credit/debit card. As always, if you have any trouble with the PayPal form or any other feature available here at The Diesel Page, please contact us as soon as possible. Thank you. November 8, 2018 - See all of the brand new editions of our 6.2L/6.5L Diesel Book Series. June 2018 - The brand new Second Edition of the Duramax Diesel Conversion Guide is now available. This brand new for mid 2018 second edition includes glossy full-color photo-quality front and back covers, a completely updated, reformatted and revised interior that includes 58 glossy pages (16 B/W + 42 full color pages) filled with updated photography and graphics - along with even more information that will help you succeed. If you haven't visited in a while, be sure to check out our Readers' Rigs page - so many smile making unique and great looking trucks/SUVs. Updated December 10, 2018 - Current Articles: 1998 Chevy LBZ Conversion, Auto Glass Replacement, 2001+ Headlight Repair, 6.2L/6.5L Tech Tips 2017, Rust, GM's 2017 6.6L L5P Duramax V-8 Turbo Diesel, Duramax Water Pump Replacement - Parts I & II, 700R4 Thottle Valve Bracket, Front Hub Bearing Assembly Replacement, Cold Weather Operation, 5.9L Cummins Diesel Conversions, Diagnostic Trouble Code P0087, Chevy Cruze, The 1984 GMC C/K Brochure, 6.5L Piston Protrusion & Head Gaskets, 1999-2007 Power Window Regulator Service, Measuring & Fitting 6.5L Diesel Main & Rod Bearings, Measuring & Fitting 6.5L Diesel Pistons, 1991 Chevy K1500 Duramax Conversion, Turbocharger Selection, Battery Service, Machinist Tools... and a whole lot more! No one does a better job of covering the GM diesels! Duramax Conversion Motor Mounts: The professionally produced generation II mounts shown here make it possible to install a new Duramax 6600 diesel engine in an early 1980s to late 1990s GM full-size. 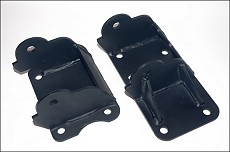 Click HERE to learn more about these Gen II Duramax Conversion motor mounts. See our 6.5L Turbo Diesel Volume III - The 6.5L Turbo Diesel Volume III represents a collection of all of the important 6.5L diesel related articles, tech columns and product reviews that were published by The Diesel Page from 2007 through early 2013. What you'll find here are time-tested and proven methods, techniques and strategies that will increase 6.5L TD performance, fuel economy and reliability. This 132 page book includes 38 articles and 264 photos, which covers information that is important to owners 6.5L diesel-equipped GM vehicles produced from 1992-2000. Available now in our book order form. We've added a new Diesel Conversion forum to TDP's Bulletin Board. After looking around the net, we saw a need for more good information as well as more photos of completed diesel conversions. The Diesel Page has published quite a few stories through the years about all manner of diesel conversions, and we've brought many of them back, and placed them in the BB forum. Check it out! It's free! Visit This Link to learn what you need to know about the new Ultra Low Sulfur Diesel (USLD) fuel that became mandatory across the nation on October 15, 2006. Check out what happened at our GM/Ford Tow Test. TheDieselPage.com's new Bulletin Board Forum is now available to all subscribing members and visitors. More features, more access, along with the best and most experienced GM diesel enthusiasts! Comprehensive Duramax 6600 books! - The new Duramax 6600 Volume I and Duramax 6600 Volume II are now available! These two volumes contain every important feature article, product review and tech article that appeared here in The Diesel Page from 1999 through early 2008. Written by enthusiasts for enthusiasts, this is the most comprehensive collection of Chevy/GMC Duramax 6600 and vehicle related information available to truck owners. All totaled, there are 43 articles in 189 information packed pages with 290 photos in volume I, and 38 articles in 133 pages with 305 photos in volume II. Visit the Duramax Diesel Page for the latest news and information about GM's new diesel. If you're considering a membership, please read What Members Say About The Diesel Page. The Diesel Page has a secure on-line membership application form. This form is powered by PayPal, the most-loved and trusted way to securely shop online. The Diesel Page began providing news and information about the GM diesels in February of 1996! If you haven't renewed or joined us yet, please do. There's tons of new information and exciting new articles coming up that I'm sure you won't want to miss. Take a look at what's currently available now in the Feature Articles Page to see just how much information we have online.